A lot of familiar faces at this event. My Uncle Frank Cosgrove is on the left of the bottom row. I also recognise Maurice Kay, Benny Murphy, Stan Millar and James McGuckin Snr. This page was added by Robert Lamb on 06/10/2013. 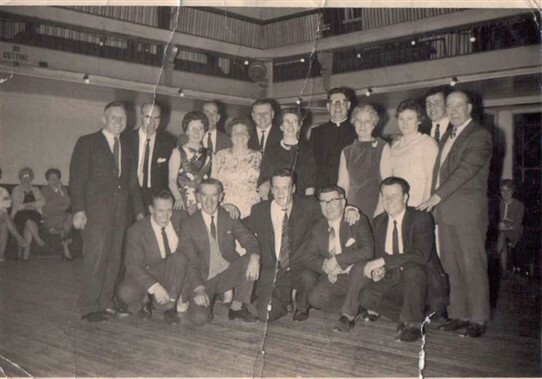 This photograph was taken in May 1967 at the 25th anniversary celebrating the ordination of Father James McMahon the parish priest of St Thomas's Church Addiewell. I think the venue was the West Calder "Poly". The lady standing in the centre behind Maurice Kay is my mum, Sadie Murphy (Higgins). My dad, Pat McKenna is second from the left. Ladies/Mrs Scott.Mrs Cammeron. Mrs Higgins. Mrs Hamilton. Mrs Bryce. Front Row/Frank Cosgrove. Eddie Kelly.Maurice Kay.James Kerr Benny Murphy.